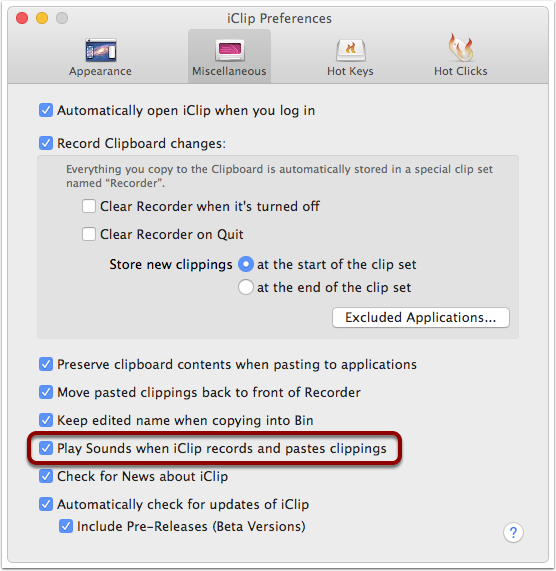 By default, iClip plays a "whit" sound whever it records or pastes a clipping. This article explains how to customize when and which sounds are played. Download a customizable sounds file here. If it's a zip file, double click it to uncompress it. Inside you'll find a text file with these instructions, a Custom Sounds folder that needs to be placed into the iClip Support folder, and an installer script that does the work for you. To change the sound to be played for Copy and Paste operations, you need to edit the Sounds.plist file inside the Custom Sounds folder. Note the two words in purple: paths and defaultMasks. These are the chapter names for the keys and values below them. Under each chapter, there are three keys: Copy, Copy Same and Paste. “Copy Same” is played when the same selection is attempted to be copied twice in succession, which will get ignored by iClip, and so you have the option to play a sound in this case. And for each of these there are values: whit.aiff, #Frog and whit.aiff for paths, and -1, 0 and -1 for defaultMasks. You may only change the parts in blue, i.e. the values. Changing anything else might break the sounds functionality altogether. The blue values under the paths chapter can specify either a file name or a system sound name. To specify a file name, simply enter the name of a sound file that resides in the Custom Sounds folder. To specify a system sound, enter the name of the sound, prefixed by the hash mark (#). As you can see, the whit.aiff exists in this folder, and is specifed for both the Copy and the Paste keys, whereas the “Frog” sound is specified for the Copy Same key. Suppose you like to play a different sound for Paste. If you have a sound file, e.g. one named “boing.wav”, place it into the Custom Sounds folder and then enter boing.wav in place of whit.aiff under the Paste key. And if you like to play the “Sosumi” sound every time you copy content to the clipboard, enter #Sosumi in place of whit.aiff under the Copy key. Save your changes, then quit and restart iClip to experience the changes. The values under defaultMasks specify under which conditions sounds are played. To enable the sounds for any condition, simply enter -1 (minus one) for their value. To turn the sound off entirely, enter 0 (zero). Initially, only the sounds for Copy and Paste are enabled, while sounds for Copy Same are disabled. For instance, to play the Copy sound only when the recorder records a new clipping or when a new clip is dragged, enter 129 (1 + 128) in the Copy key’s value. Note: The value -1 is a shortcut to enable all conditions.